At Phelps, we have learned many lessons. Perhaps one of our greatest lessons is that often all a student needs is one person to take a genuine interest in them; this could make the difference between a bright day and a dark one. With our students, we know that there is no cookie-cutter formula for reaching them, and we see that when we pair volunteer tutors with our elementary and high school students. 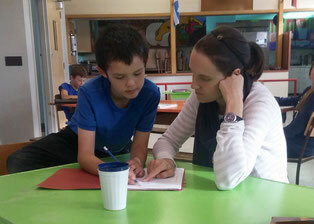 We see that spark that appears when a volunteer sits beside a student, giving them their undivided attention. We see that sheepish grin as a new student appears at a door after five different people have encouraged them to come to Phelps. We see that sideways glance when we say that taking pride in your work is important and worth it. They are listening. These moments are hard to quantify or measure, but they are at the very heart of what Phelps, and its volunteers do everyday. Look for these moments, they often act as a tipping point for a student and are catalysts for moving forward.